Get notified when Hamilton tickets are available! Hamilton is an award-winning musical about the life and times of the American historical figure Alexander Hamilton. 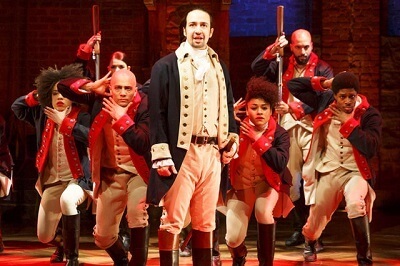 Based on the book by the same name by Ron Chernow, the musical was written by Lin-Manuel Miranda and made both its off Broadway and Broadway debuts in the same year–2015. Hamilton is typically shown at Broadway theaters in New York City, New York, and touring productions of the musical travel around the United States, bringing the show to major cities. You can attend a performance in New York or close to home by purchasing Hamilton tickets using the links above.